The fairytale adventure continues in My Kingdom for the Princess 3, a wonderful new sequel to the award-winning series. 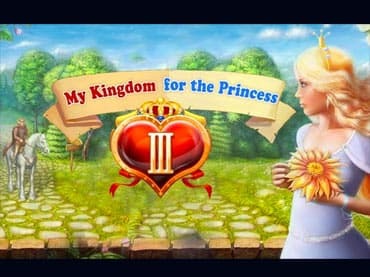 If you like this free game, try My Kingdom for the Princess 4. It's been twenty five years since Arthur and the beautiful Princess Helen last made their way home. They settled down, became a royal couple, and enjoyed their time. But time passed, their children grew up, and now it's time for one of their three sons to succeed them. The adventures begin when all three sons decide it's time to get married. Unfortunately for them, they all fall in love with the same woman - the lovely rich heiress Princess Elizabeth. She is waiting for someone who can prove his worth by showing his ability to save and manage the kingdom with strategic mind and a warm heart. She needs someone who can defeat the traitors, save the country from ruins, and proclaim his undying love for her! - Defeat traitors and save a country with many new surprises to win unique trophies. If you have questions about My Kingdom for the Princess 3 game, please contact us using this form.